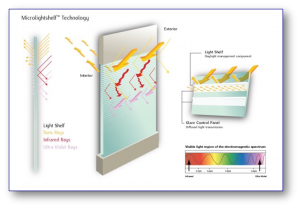 Digital Daylight has globally patented technologies that, utilising digital manufacturing techniques, create bespoke, digital on demand coatings for windows. 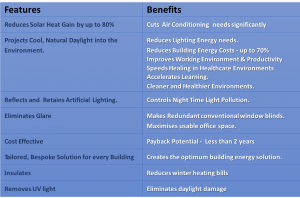 The core SolaVeil concept is to use digital techniques to combine the best elements of existing light management technologies (Brise Soleil, Louvres, Light Shelves, solar films and window blinds) into a single cost effective solution that eliminates their inherent disadvantages. DDL Solaveil technology can be applied directly to glass, or via a flexible substrate as a builidng retrofit together with window blinds.